Being a first time parent is scary. The minute you bring your little bundle home, you suddenly become aware that you have no idea what you’re doing. It’s your job to keep baby safe, which often means you’re constantly looking out for potential problems. Illness can be a particular worry, with even the slightest sniffle causing you to go straight into protective parent mode. One of the biggest concerns new parents have is vomiting. You know some level of vomiting is normal, but how can you tell if your baby is vomiting more than they should be? To help ease your mind, below you’ll discover more about why babies vomit and what to look out for to establish whether there’s a problem. Click to download a free printable checklist of everything you need to carry with you while your baby is vomiting, along with a PDF copy of this post! It’s extremely common for babies to vomit, especially during the first few weeks. As their tiny bodies begin to develop and they adjust to actually feeding, rather than being fed through the umbilical cord, it can cause an upset tummy. Firstly, it’s important to tell the difference between posseting and vomiting. You may not have even heard of posseting! Basically it’s where tiny amounts of milk are brought back up. It happens when your baby’s tummy is full and the milk bubbles out a little at the lips. If you see parents walking around with cloths and spare bibs, this is often the reason why! Vomit on the other hand brings up a lot more liquid and it’s often a different color to posseting. So within the first year you’re going to see a lot of natural vomiting. It’s not just frightening for you either. Your baby can become frightened when they vomit, which often causes them to cry, further deepening your concern that something’s really wrong. 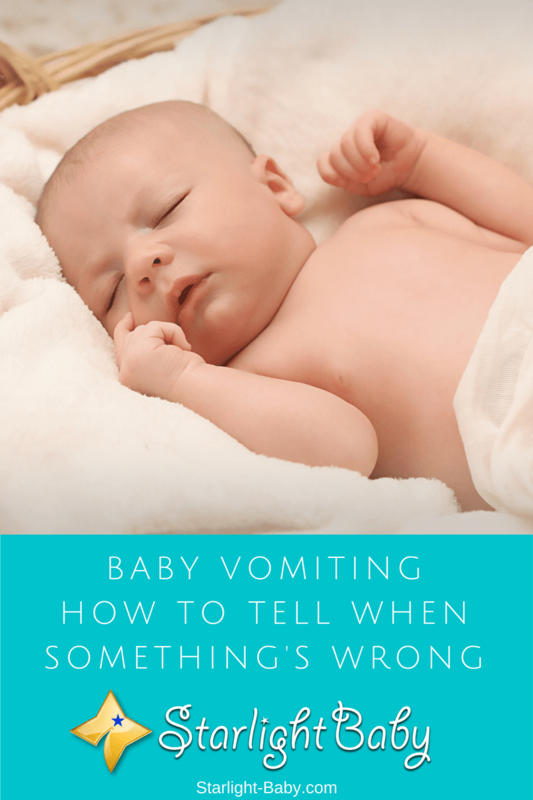 So now you know the many reasons that could be causing your baby to vomit, the question is how can you tell if something is actually wrong? Normal vomiting will usually subside within 6 hours, though sometimes it can last up to 24 hours. That doesn’t mean they’ll vomit constantly for up to 24 hours – they will simply go through phases of vomiting within that time period. Ensuring they stay hydrated is crucial during this time, but actual treatment won’t be necessary. Potential problems can arise after a few months. If your baby suddenly vomits it could be a sign of gastroenteritis or a similar tummy infection. If it is this type of infection it will usually come hand in hand with diarrhea. More common vomiting could be a sign of a food allergy. If you suspect this to be the case, take baby to the doctors before you try removing any food groups from their diet. They will be able to test for food allergies and give you a proper diagnosis. Removing any food group can be detrimental to your baby’s health if they don’t have an allergy which is why it’s important to get a professional opinion. Of course, if vomiting is also accompanied by a cold, ear infection or urine infection, it’s also a sign that something’s wrong. Now, it’s always best to stick with your gut instinct. If you feel something isn’t right don’t hesitate to go to the doctor. It’s always better to be safe and get baby checked out, if only to give you peace of mind. It’s very rare for vomiting to be a sign of a serious issue, but if you do notice any of the above symptoms you should take baby to get checked out just to be safe. It’s also worth noting that a little blood in the vomit can be normal. If your baby was completely fine and healthy before they vomited, the blood or bile could be caused from the force of vomiting. They could also have a tiny cut in their mouth which has bled a little as they vomited. If they continue to vomit up blood or the amount of blood being brought up is increasing, that’s when you should call the doctor. As you can see, there are a lot of different causes of vomiting in babies and most of the time it’s absolutely nothing to worry about. However, you’re a parent now and it’s your job to worry. If you’re really concerned and need reassurance, don’t delay in going to see your doctor. They’re there to help and understand your concerns. In the meantime if the vomiting isn’t serious, ensure baby stays well-hydrated and let them rest longer than usual. You are right, it gets scary when our baby starts vomiting, and sometimes we think is something worse when is nothing important. Still, we must pay attention to all signs that our baby offers us and avoid a bad situation! I wish I had read this article a long time ago. I have a 10-month-old baby and in the last ten months, I have already discovered what babies vomit and what should we do when the baby vomits. Currently, my baby is suffering from a dry cough. Due to this coughing, he vomits while feeding. In order to cure vomiting, we need to treat a cough first. Enter your first name and best email to receive a printable bonus checklist along with a PDF copy of this post!